I am going to try something new, see how it flies. A new series I want to call "Sunday Secret" where I share a quick tip, trick or technique that makes my beauty life or just life in general a little easier, a little more beautiful. My first Sunday Secret has to do with fallout. You know... That fine, powdery eye shadow residue we can get under our eyes when applying our eye makeup. I know what you're going to say. "I only use high quality eye shadow. I don't get fallout." I thought the same thing... I only use high quality eye shadow, I apply carefully. Then one day, I checked my look in a 10X magnification mirror. Well, gentle reader, don't despair. There is an easy way to combat the post smokey eye fallout. I grab a clean cotton swab and my package of makeup remover wipes and I slide the cotton swab in and roll it lightly across the surface of the top makeup wipe, dampening the swab but not saturating it. Then I use the dampened swab to clean up the fallout under my eyes and anywhere else it has landed, checking in my magnification mirror to be sure all is tidy. If I need to, I flip the swab, roll the other end and repeat. 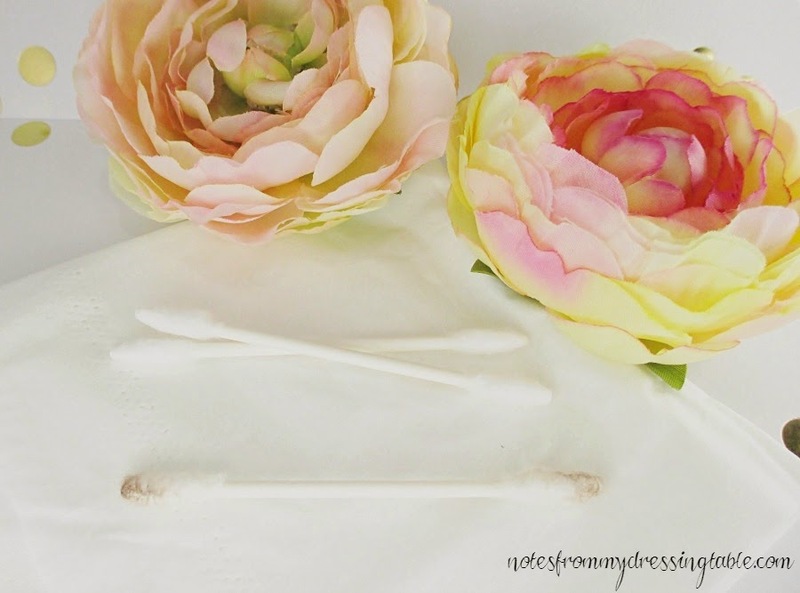 I use Precision Tip Q-Tips because it allows me exact control around my eyes, lets me remove just what I want, without disturbing the eye shadow I want to leave behind. It also lets me sharpen up any little areas that might need it. By rolling a cotton swab on a makeup wipe, I get some remover on the swab but it isn't as saturated as it is when I dip it in my eye makeup remover. I get the cleanup without leaving so much remover residue behind. I don't have to cleanup after the cleanup. Then I just apply a dot of moisturizer under each eye (you can skip this step if your skin doesn't require it... I'm a #driedoutoldhag) apply my under eye corrector, my foundation or CC cream and concealer and finish my face. See all of that dark shadow on my cotton swab? That was from a moderately smokey eye look. I didn't even go full on deep and dark. Imagine if I had left that under my eyes, on top of my dark circles? What do you do to combat fallout when you are applying a smokey eye? Do you think that you might try this technique? If you do, let me know if if worked for you. I'd love to know. Just drop me a comment here, anytime. I get e-mail notifications of all new comments so I'll see it. I hope that you found this helpful and that you'll come back next week for another Sunday Secret. I use q-tips as well...apart from applying eyeshadows before foundation, and holding a piece of paper below the lower lid while blending. Great tip! Very helpful to know. What an awesome tip! I'll have to try this! Such a smart tip! Thanks for sharing. I like that it is effective but doesn't leave behind a mess. Fall out....the bane of makeup users!!! ARGH!!! I have one of those whispy, flat fan brushes that is soooo soft and that's what I use along with Q-Tips. Thank goodness I have one of those huge, magnifying mirrors with a circle light around it. I need a better makeup mirror. Mine is... Clunker City. lol I need to pick up a smaller, super soft fan brush. I have a huge one but I need a smaller one. Fall out is never fun! This is a great tip! Thanks so much for linking up for the best of the blogosphere!